I’ve had to work recently on an older Linux based machine and as such most of my usual routes to edit and display data aren’t available to me. I needed to preform a join between the Small Areas geometry and the Small Areas table, both of which are available from the CSO’s website here. Even though the csv only has ~18,000 rows, the field calculator in QGIS 3.2 Bonn couldn’t cope and kept crashing. Enter python to the rescue, I downloaded the Geany python IDE which I find to be nice and lightweight for older computers. I needed to remove the first 7 characters from the ‘GEOGID’ field. All of the values in this column started with ‘SA2017_’. The following is a quick few lines in python 2 to remove the first 7 characters using python’s built in csv module. For reference, on this very average laptop from 2011 it took 3 seconds to run. I was reading an article online the other day about Brexit and I got thinking about all the Irish people (myself included, at least for the next two weeks) that live in the UK. I’ve never heard much said about the people from the UK that live in the Republic. With no surprise, the border counties contain the highest percentage of persons living in them who were born in the UK. 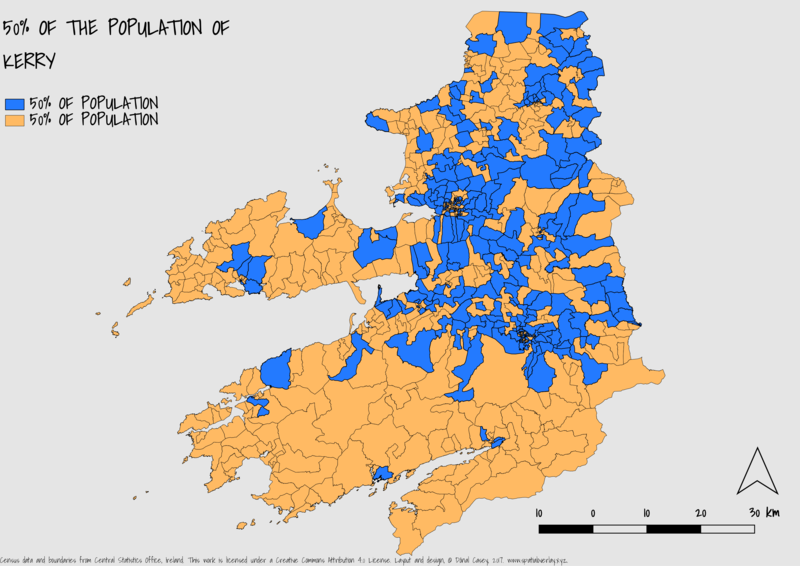 So, the question now is, if we exclude the border counties (Donegal, Leitrim, Cavan, Monaghan and Louth) where in Ireland has the highest percentage of persons living there who were born in the UK? I used the small area spatial unit for this analysis. The answer is, Templenoe, County Kerry. Templenoe is 6km to the west of Kenmare. Obviously, I can’t say for sure but I would be tempted to guess that part of the reason for this is the presence of the Ring of Kerry Golf Course. Twenty of the sixty-nine people who live there were born in the UK. 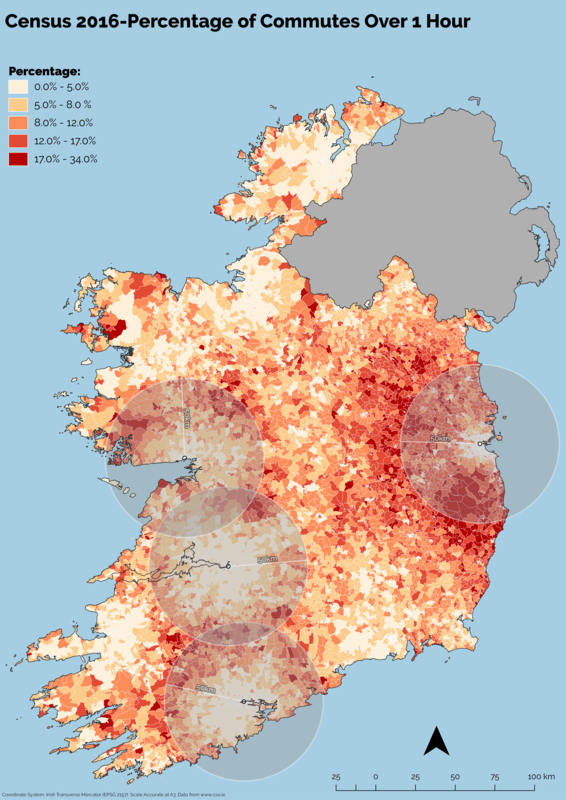 I was reading ‘Project Ireland 2040-National Planning Framework‘ and it got me thinking about what percentage of people in each ED commute for an hour or more to work. This is exactly the type of unsustainable living that needs to be avoided by promoting as much infill development as possible in existing urban centres. Below is a map I created that shows the commuting times that people face, obviously, it is important to bear in mind that the stark red colour still only equates to a maximum of 34% of people commuting for an hour or more. This is still just over one third, which is significant. Although not designed with the purpose in mind it gives a good indication of the functional urban area of the major cities (especially Dublin).